Records are meant to be broken. That was the case Friday, May 22nd as 137 drivers checked-in for a regular night of racing at the Dacotah Speedway. 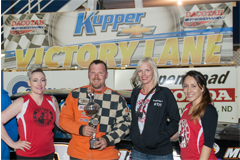 It was a new track record for the race track that boosts to have the highest number of IMCA Modifieds and WISSOTA Streets Stocks in North Dakota. Despite the record high car count, the final checkered flag waved shortly at 10:10pm, only taking three hours and 10 minutes to complete the entire show. The track was smooth and fast, which led to some amazing racing throughout the evening. The IMCA Sport Compact feature hit the track just before intermission. Bismarck's Nic West stormed to the front, taking the lead from pole sitter Michelle Stoxen. Chance Seelye of Regan, ND quickly passed Stoxen for second and challenged West for the lead. Seelye got loose entering turn three and spun out, collecting Alex Thompson, who had no where to go, ending their night. On the restart, Jason Berg sliced and diced his way into second, bringing Chase Schlafmann with him before the second caution flag waved on lap three. Schlafmann slipped by Berg on the restart, just before yet another caution regrouped the field. Berg retook second on the restart and charged into the lead and Schlafmann followed. The leaders raced single file while Kody Stoxen tried to hold off Tom Dworshak for fourth. The two drivers made contact off turn two, leaving Stoxen spun out on the backstretch. Due to time limit, the race was called short of it's scheduled distance. Jason Berg led the final two of the six laps to win his first feature of the season over Chase Schlafmann. 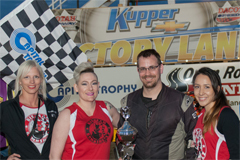 Nic West finished third while Michelle Stoxen and Josh Roehrich missed the last lap wreck to finish fourth and fifth respectively. Pole sitter Kevin Bitz of Kintyre, ND led the field to the green flag in the Hobby Stock feature. As Bitz started to pull away from the field, Jeremy Engelhardt and Roy Erickson battled hard for second. E rickson would win the battle, leaving Engelhardt with his hands full with a strong Brent Vetter. A lap four caution regrouped the field but on the restart, Bitz got loose exiting turn four, allowing Vetter to slip into the lead. Bitz and Keith McCleary raced hard for second while Nathan Messer lurked in fourth. A caution on lap eight reset the field and on the restart, McCleary passed Bitz for second before another caution slowed the pace. McCleary challenged Vetter for the lead on the restart while Messer passed Bitz for third. On the final restart of the feature, Jaren Wald passed Bitz for fourth place. Bitz tried to hold off Wyatt Rath-Wald and Josh Anderson for fifth. The three drivers raced three wide and coming out of turn four and to the Open Road Honda finish line, Rath-Wald made a last lap pass to finish fifth ahead of Bitz and Anderson. Jaren Wald finished fourth behind Nathan Messer, Keith McCleary and feature winner Brent Vetter. When the green flag waved, Steven Kuntz dove his car low under pole sitter Andrew Sommerfeld, Paul Morman and Anthony Kopp to take the lead in the INEX Legends feature. Kuntz's car was the strongest racing next to the guardrail while Sommerfeld, Shane Williams and Donavin Wiest raced three wide for second. Wiest shuffled into second position while Williams and Sommerfeld continued to race for third. With eight laps to go, Sommerfeld got loose, allowing Williams to overtake third place. Sommerfeld now had his hands full trying to hold off a gaggle of cars including Kevin Jensen, Preston Martin, Drew Papke and Anthony Kopp. A caution with four laps to go erased Kuntz's lead, putting last year's track champion, Wiest, on his rear bumper. It was a four car battle for the win on the restart with Kuntz hugging the guardrail, Williams and Papke racing the middle and Wiest flying around the high line. 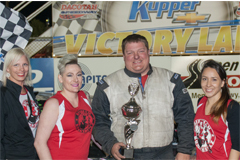 However, Kuntz's low line around the 3/8's track prevailed, just narrowly edging Wiest and Williams at the finish line to pick up back-to-back feature wins at the Dacotah Speedway. Drew Papke finishing fourth while Anthony Kopp rounded out the top five. Pole sitter Chris Michaelsohn pulled away from the field at the start of the WISSOTA Street Stock feature. It was a three wide battle for second between John Feist, Jeremy Schmidt and Scott Olson. They raced hard for several laps until Schmidt took second place from Feist on lap six. Feist fell into the clutches of Matt Dosch. As they raced side by side for third, Shawn Volk used his low line, next to the guardrail to pass both Dosch and Feist for third. Dosch rallied back on the high side of the track and they continued to battle for third. As the laps continued to wind down, Feist's car started to fade. He had his hands full trying to hold off Barrett Berg and Matt Brendel for fifth. Feist couldn't hang on, as Berg slipped by for fifth with five laps to go and Brendel drove by with three laps to go. Despite running top five all night, Feist would cross the finish line seventh. Shawn Volk edged Matt Dosch by inches to finish third. Jeremy Schmidt finished a distant second behind feature winner Chris Michaelsohn, who led all 20 laps to win his first feature victory at the Dacotah Speedway. Bismarck's Quentin Kinzley and Brent Schlafmann started on the front row of the IMCA Modified feature. Kinzley grabbed the lead in turn one but pushed high in turn four, allowing Schlafmann to sneak by to lead lap one. Schlafmann's lead was short lived as Jason Wolla blew by to take the lead the following lap. Schlafmann's car quickly faded through the field, losing positions to Shawn Strand, Rusty Kollman and Mark Dahl. Dahl's high line around the track helped him overtake third from Kollman, bringing Jeff Taylor and Jeremy Keller with him. Taylor looked low under Dahl while Keller lurked behind in fifth. 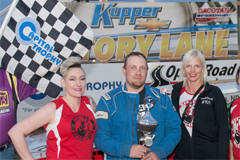 As Dahl, Taylor and Keller battled for third, Estevan's Aaron Turnbull quickly caught and passed the veteran drivers for third. As the leaders caught the tail end of the field, Turnbull reeled in Strand for second. With five laps to go, Turnbull and Strand raced side by side for second. Lapped traffic hurt Strand as Turnbull drove by with three laps to go. 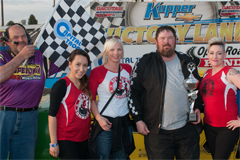 However, Turnbull ran out of time and had to settle for second behind feature winner Jason Wolla, who picked up back-to-back feature wins at the Dacotah Speedway. Shawn Strand finished third while Jeremy Keller finished fourth ahead of Mark Dahl. This Friday, May 29th will be a Hobby Stock Special sponsored by Hedahl’s Auto Plus and Image Printing. In addition is the rescheduled General Equipment Late Model show. Sport Compacts have the night off. 6:40pm – Pit meeting at the infield scale. All drivers are to attend. Adult admission is $16, 12 and under is FREE. Advance, discount tickets are available at all Tri Energy Cenex locations in Mandan, Bismarck and Lincoln.